The Alaska RV park and campground members of ACOA are generally privately owned, and each Alaskan campground is as unique as its owner! 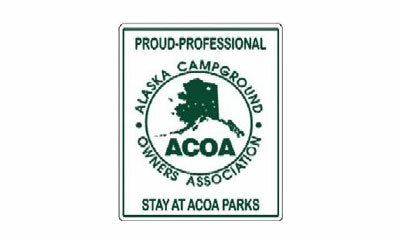 Wherever you are in Alaska, you are never far from an ACOA campground. Because of the variety of members and services offered, we are able to meet the needs of campers from all backgrounds. We understand that you are looking for your own unique Alaska traveling experience, and strive to fulfill your expectations. Are you looking for a peaceful camping site by a lake or near a glacier? A park with the conveniences of the city? Access to local tourist activities? Our parks can accommodate your traveling style, whether you are traveling in a motor home, fifth wheel, pop-up, or tent camping. Many of our members also offer room and cabin rentals. We can meet many of your other traveling needs as well. While there may be other camping choices in Alaska, ACOA members offer amenities such as Shower and Laundry Facilities, Wi-Fi and Dial-up Modem access, Cable Television, Dining, Gift and Convenience Shops, Local Information and Activity Booking, and much more.